Needless to say, I’ve been doing a fair amount of scrambling around lately to get things in order before school starts. Besides all of the paperwork, immunizations and phone calls, I’ve also started to collect some quick and easy recipes in anticipation of those days (weeks?) when I simply can’t pull myself away from my books for more than 15 or 20 minutes to make something to eat. Since I’m kind of the reigning queen of the 2-hour dinner preparation, this has been no easy task for me. However, I’ve learned a few things already in my recent attempts at efficient cooking that are already helping me to shorten up my time spent in the kitchen just a little bit. 1. Organization is key. An organized shopping list, organized cabinets and refrigerator (easier said than done! ), and an organized prep area make meal prep so much more efficient. No running to the store for something you forgot and no tearing your cabinets apart looking for that one ingredient. 3. Stir fries are your friend. 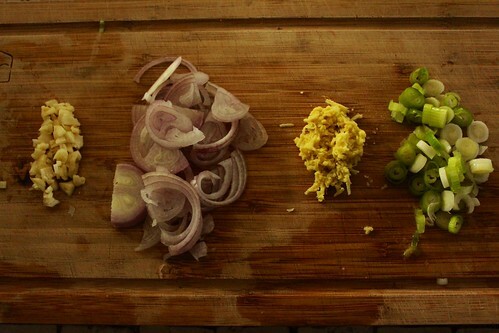 Ten minutes to chop up some veggies and whisk a sauce together. Five minutes to cook. Done. 4. The slow cooker is your very best friend. Enough said. Now, don’t get me wrong. This is certainly not going to turn into a complete overhaul in the way that I cook. It’s simply my way of dealing with the fact that very soon I will no longer have the luxury of plentiful cooking time. You can bet when I do have the time, though, that I’ll be spending 4 hours using every dish in the house to make a ridiculous ultra-feast! 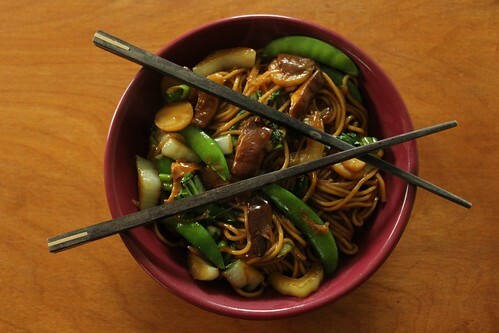 In the meantime, here is one of my favorite quick and easy dinner recipes for veggie lo mein. I haven’t timed it, but I’m pretty sure it comes together in less time than it would take to pick up Chinese takeout. I’m sure all of you have your own go-to, super-quick weeknight dinner recipes, so help a girl out and post a link or two in the comments! As written, this recipe makes a super-saucy, Chinese-takeout-style lo mein. I’ve also made it with an additional 3 oz of noodles for a less saucy dish. Either way is great, it just depends on your preference. If you don’t like this particular combination of veggies, throw in whatever you like or happen to have on hand. About 4 to 5 cups of raw veggies should be perfect. Cook the noodles according to the package directions. Drain, rinse, and set aside. Meanwhile, prep and slice all of the veggies. Whisk together the sauce ingredients and set aside. Heat the sesame oil in a wok or large skillet over high heat. When the oil is nice and hot, add the sliced shiitakes and saute, stirring often, until they are softened. Next, add the garlic, ginger, shallots, and the whites of the scallions. Continue to saute until the shallots begin to soften, just a minute or two. Add the bok choy, snap peas, and water chestnuts and cook just until heated through. Add the noodles to the wok and toss to combine with the veggies. Pour the sauce over the noodles and veggies and toss until the noodles are coated and the sauce is bubbling. Remove from heat and stir in the scallion greens. Congratulations on getting accepted to nursing school!! You will be very busy! When do you start? Ooh I love healthy alternatives to take-out and this looks and sounds a treat!